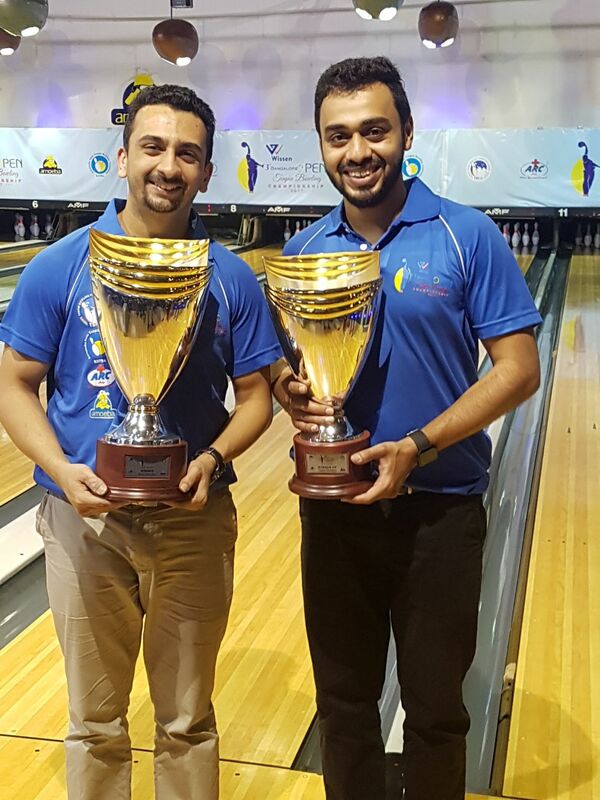 Dhruv Sarda of Delhi retained the title at the Wissen 3rd Bangalore Open Tenpin Bowling Championships which concluded at the Amoeba Bowling Center. 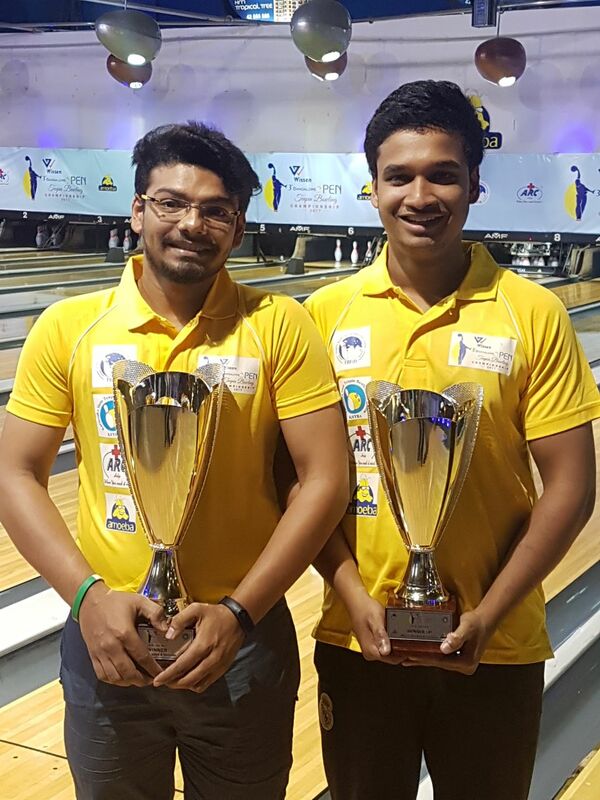 In the Finals of the Open Division, played on Challenge the Leader Format, Top Seeded Dhruv Sarda comfortably won the match against Shabbir Dhankot of TN (234 – 180) to take home Prize money Rs 1.25 Lakhs. Dhruv who started with 2 spares followed it up with a turkey in next 3 frames. And finished the final 2 frames with a bagger and a score of 234. Shabbir opened Frame 1 with a 7 - 10 split scored double strikes in next 2 frames. But he opened again in Frame 8 and did not get connection of strikes to finish with score of just 180 and losing the finals. Earlier Shabbir had pipped local favorite Akaash Ashok Kumar by 2 pins (247- 245) to move into the Finals. 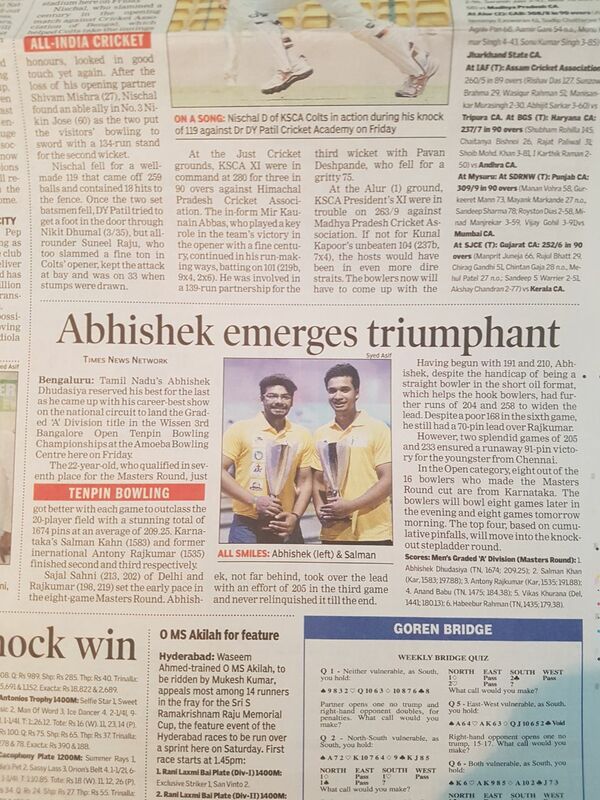 Akaash comfortably won his match against teenage sensation Kishan R of Karnataka who played his maiden Step ladder round (247- 158). In the Masters Round of the Open Division, Dhruv Sarda (3418), Shabbir (3404), Kishan R (3357) and Akaash Ashok Kumar (3346) finished on top of the table after 16 games and made it to the Step Ladder Knock out Round. 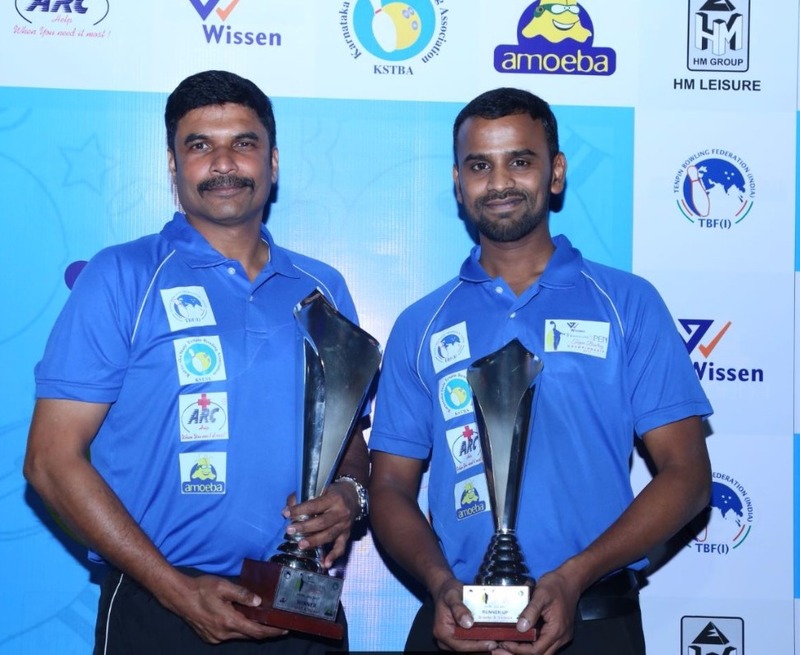 Abhishek Dhudasiya of Tamil Nadu won the Men's Graded ‘A’ Division Title at the Wissen 3rd Bangalore Open Tenpin Bowling Championships – 2017 being held at the Amoeba Bowling Center, Church Street, Bangalore. In the Masters Round, held this morning, where Top 20 bowlers bowled 8 games block to decide the winner based on total pinfall. Abhishek bowled quite consistently, scoring 6 games above 200 and ending up with total pinfall of 1674 and an impressive average of 209.25. 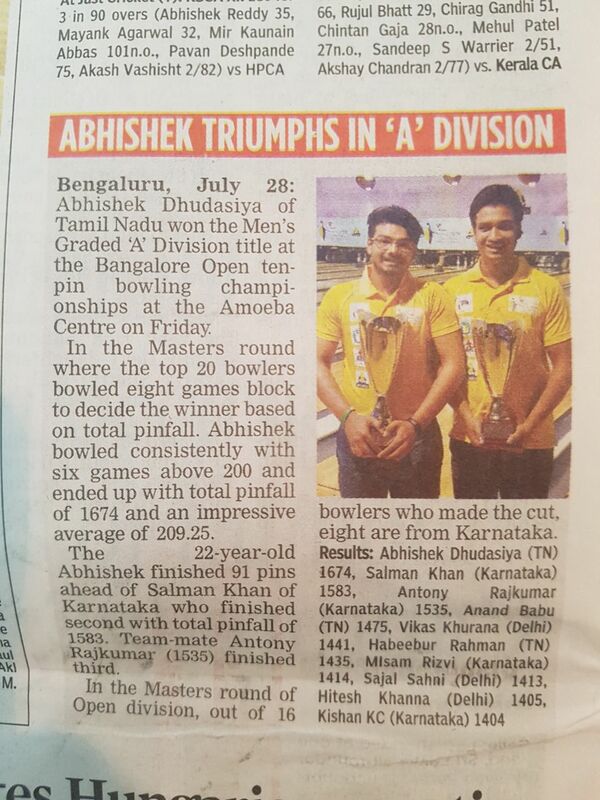 The 22-year-old Abhishek finished 91 pins ahead of Salman Khan of Karnataka who finished 2nd with total pinfall of 1583. Former International Antony Rajkumar (1535) of Karnataka finished 3rd. 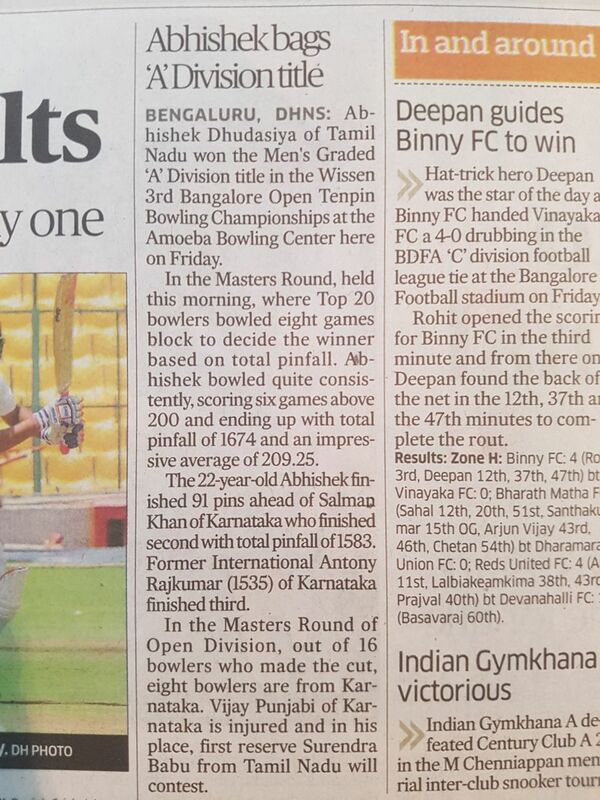 In the Masters Round of Open Division, out of 16 bowlers who made the Cut, 8 bowlers are from Karnataka. Vijay Punjabi of Karnataka is injured and in his place, 1st Reserve Surendra Babu from TamilNadu will play this evening. All 16 bowlers will bowl 8 games this evening and 8 games tomorrow morning. Top 4 bowlers, based on cumulative pinfall of 16 games will move to the Knock-Out Stepladder round. The Finals will be held at 5 pm tomorrow. 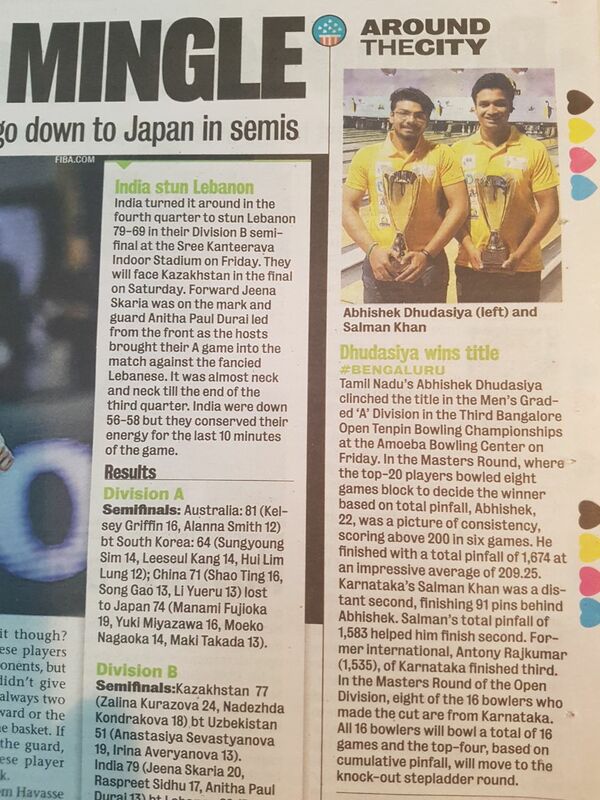 Shabbir & Dhruv Sarda Continue to lead . Sambhrant Srivastava( 1314)of Delhi and Huned Khokkar ( 1316) of Karnataka moved up to 5th and 7th respectively . 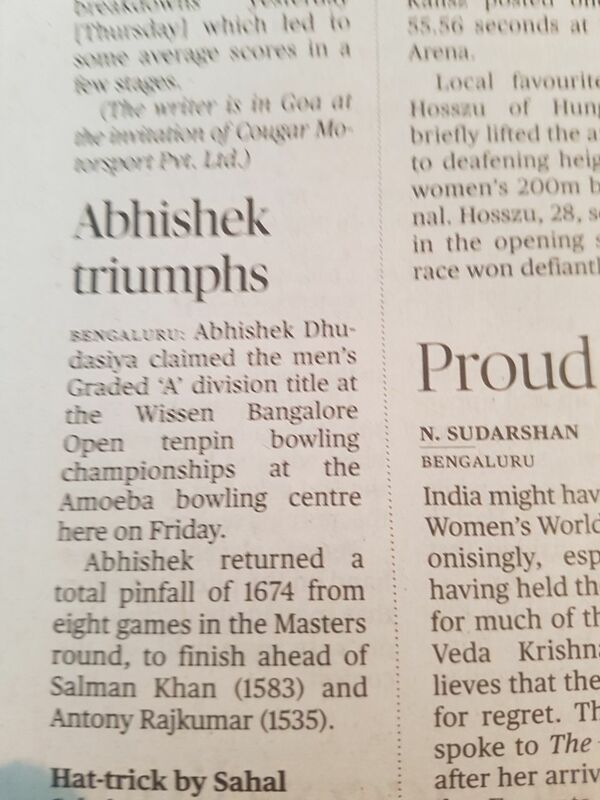 Former National Champion Shabbir Dhankot made a fine come back in the qualifying rounds of the Wissen 3rd Bangalore Open Tenpin Bowling Championships currently underway at the Amoeba Bowling Center. 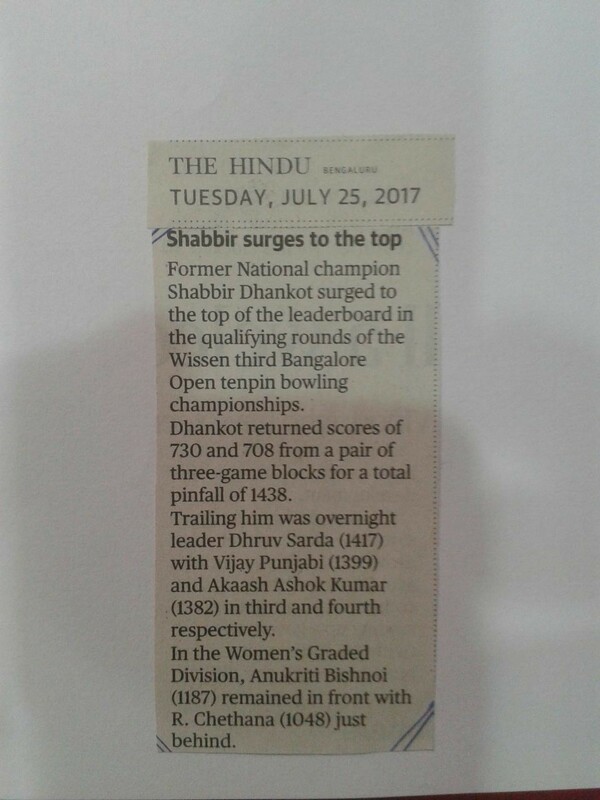 Shabbir who was struggling in find his rhythm, struck form on Monday with two back to back blocks of 700 series,scoring 730 and 708 and climbed to the top of leaderboard. Shabbir is currently leading the table in Open Division with total pinfall of 1438. Overnight leader Dhruv Sarda( is in 2nd position with 1417)..
Vijay Punjabi ( 1399) And Akaash Ashok Kumar ( 1382) of Karnataka are in 3td and 4th position respectively. 17 year Old Kishan R of Karnataka .scored highest block of 659 and finish overall 5th with total pinfall of 1306 . 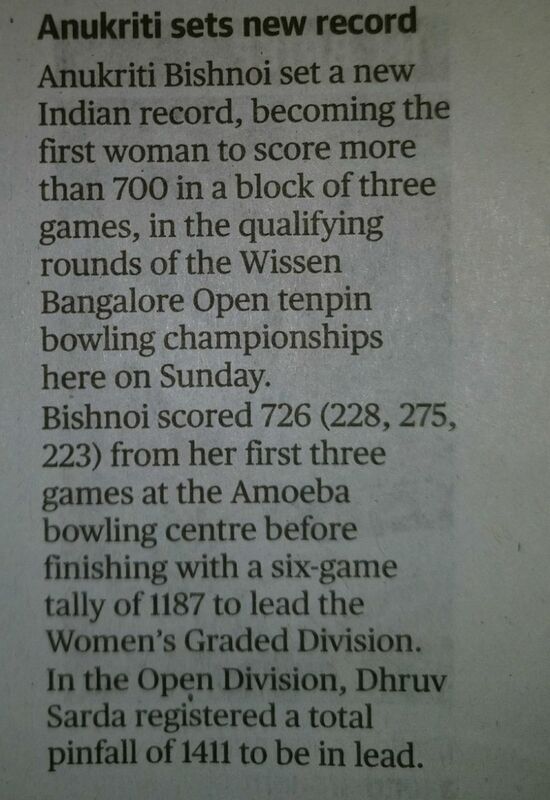 Anukriti Bishnoi( 1187) continues to lead. Local Hope Chethana R of Karnataka improved her tally by 52 pins to finish the day in 3 rd position with 1048 pinfall. For Squads 11 and 12, please note bowlers in Grade A and Open categories may reserve their squads. Graded B masters: Last MQ Round for Graded B Masters will be Squad 9 i.e, Squad starting at 9:10 pm. Due to higher number of bowlers competing to qualify for the masters round in Graded B, please note that preference will be given for all Men's Graded B bowlers in Squad 9. Women's Graded masters: Last MQ Round for Women's Graded Masters will be Squad 8 i.e, Squad starting at 7:45 pm. 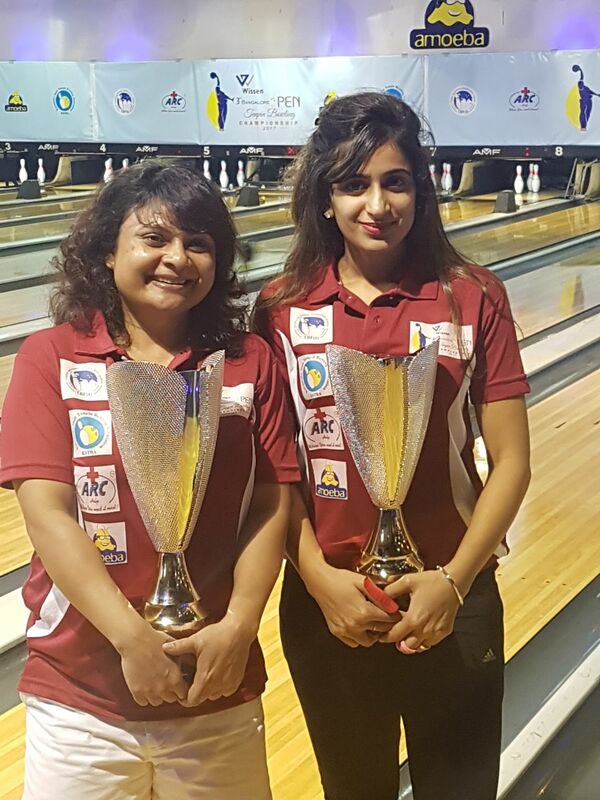 Anuradha Sarda and Shilpi Jaiswal ~ Please note that your slots are accommodated in Squad 8 instead of Squad 9 as it is the last squad for Women's Graded Masters Qualifying. H V Sarda, N T Ganesh, Anand Babu and Abhishek ~ Please note that you might want to reschedule your planned MQ's for Squad 9 so that you can accommodate Group B bowlers from your State in this Squad. Check in at 7 30 am . Check in at 9 30 am . Masters Round will start at 10 am ..
All participants are requested to kindly note the above mentioned points and plan their MQ's accordingly. 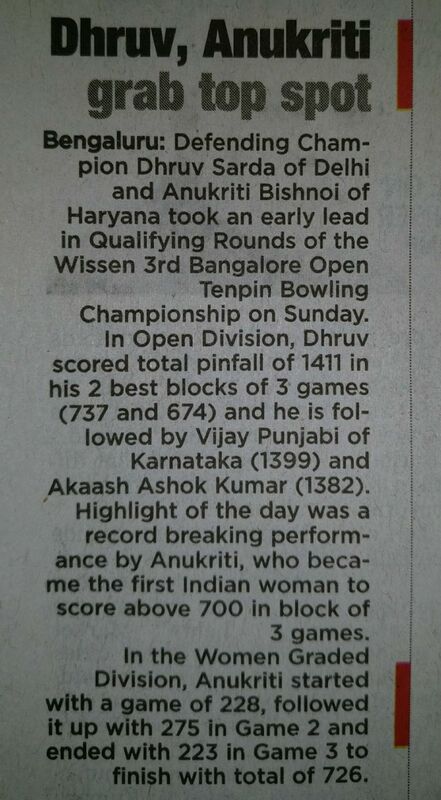 Former Bangalore Open Champ Shabbir Dhankot (TN) finally found his rhythm and scored his highest block with 666. Shabbir is currently placed 2nd in Outstation pool with total pinfall of 1287. 17 year old Kishan R of Karnataka played steadily to score his highest block of 659.Kishan, the 4th player in the Championship to score 1300 series in best 2 blocks of 3 games, is topping the Mixed pool with total pinfall of 1306. 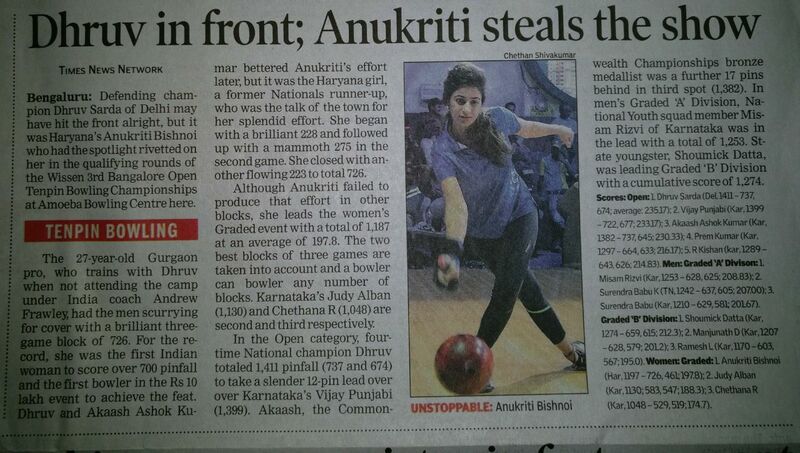 Anukriti Bishnoi ( Haryana ) currently the only woman to figure in Top 14, is the cut with total pinfall of 1223. Vikas Khurana of Delhi who Scored 613 and 571 is in 2nd position in outstation pool . Ramesh L of Karnataka ( 1170) And Vamsi Mohan ( 1151) of A.P consolidated their positions to qualify for the Masters Round. 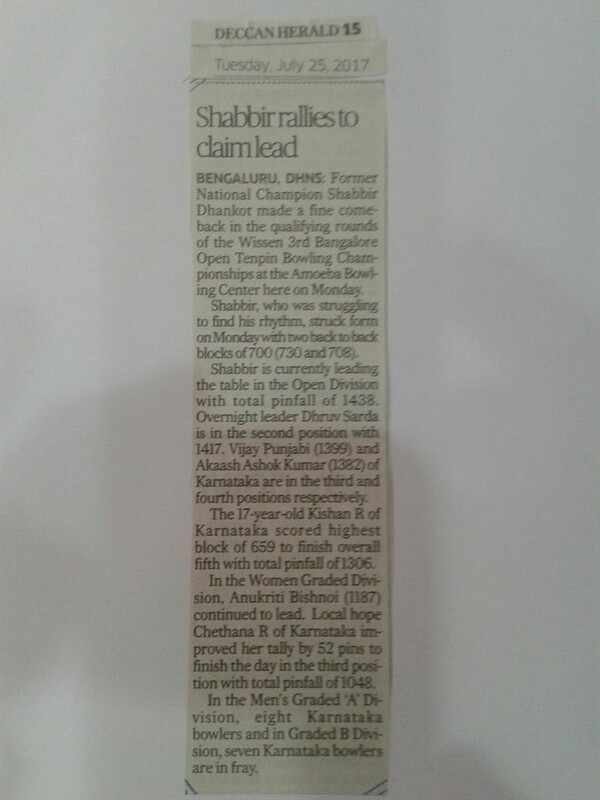 Chethana R ( 1048 ) of Karnataka and Anuradha Sarda ( 1002) of Delhi improved by 52 pins and 82 pins respectively. Defending Champ Dhruv Sarda got into the groove in the first block itself !! Scoring 280 in Game 3. Dhruv finished with 737 and is tied with Akaash for the Highest Block of the championship. Dhruv is currently in lead with 1411 pins followed by Vijay Punjabi ( 1399 ) and Akaash ( 1382). 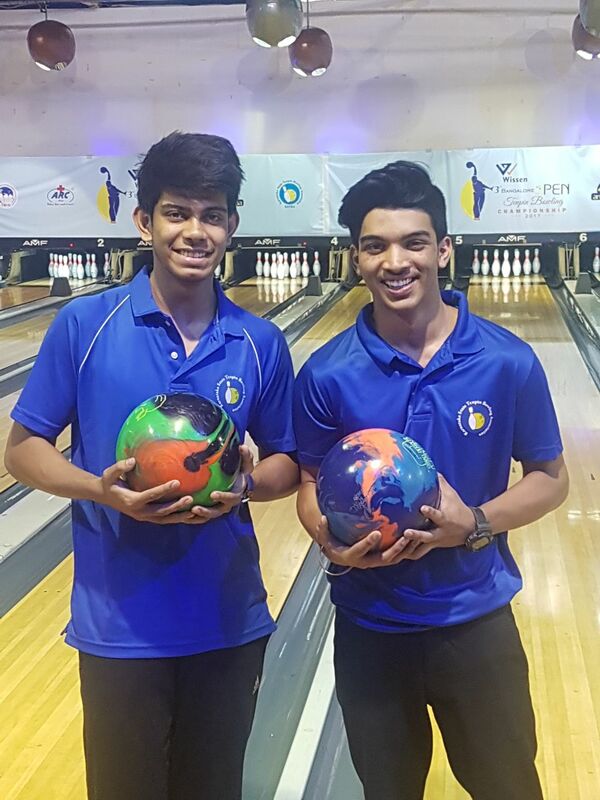 Ganesh NT from Tamil Nadu worked his way up to 2nd position in Outstation pool , scoring 643 ,626 and total of 1269 ..
National Youth Squad members , Kishan R and Shoumick Datta found their rhythm and scored 647 and 650 respectively . 17 year old Mizam Rizvi .is topping the table with total pinfall of 1253, followed by Surendra Babu ( TN) 1242. Anukriti Bishnoi ( Haryana)( 1187 ) and Judy Alban ( 1130 ) are on top.